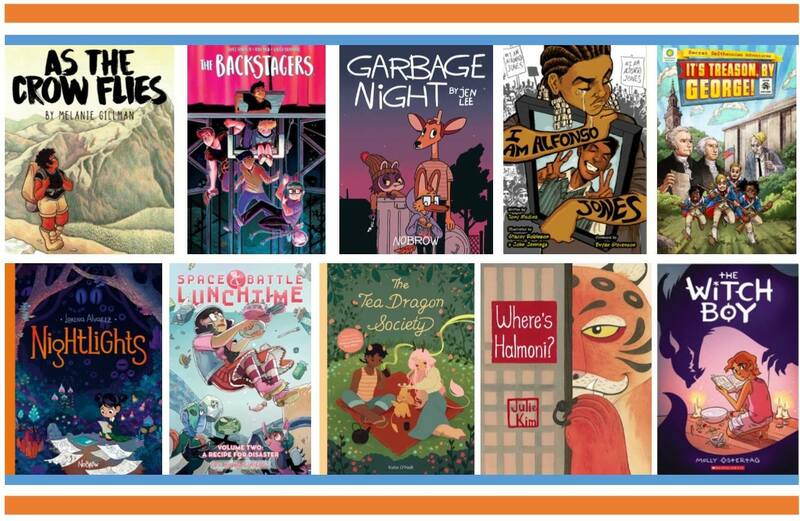 The finalists for this year’s Dwayne McDuffie Award for Kids’ Comics were announced May 2. Presented at the Ann Arbor Comics Art Festival, the award runs in tandem with the Dwayne McDuffie Award for Diversity and focuses on comics aimed at young readers. As the Crow Flies, by Melanie Gilman, features Charlie Lamonte—thirteen years old, queer, black, and questioning what was once a firm belief in God—during a summer vacation stint at an all-white Christian youth backpacking camp. The Backstagers Volume 1: Rebels without Applause, by James Tynion IV and Rian Sygh, follows transfer student Jory to an all-boys private high school, where he’s taken in by the only group that doesn’t treat him like a new kid, the lowly stage crew known as the Backstagers. I am Alfonso Jones, by Tony Medina, Stacey Robinson and John Jennings, stars an African-American teen who loves to play trumpet and dreams of playing the lead in his school’s hip-hop rendition of Hamlet, but who becomes the victim of a police shooting, and watches from the afterlife as his family and friends struggle for justice. It’s Treason, by George! by Steve Hockensmith, Chris Kientz and Lee Nielsen, takes four friends on a time-traveling adventure to undo the work of plotters who have turned American history upside-down and replaced over two hundred years of democracy with the rule of monarchs. Nightlights, by Lorena Alvarez, introduces Sandy, who catches the tiny stars that appear out of the darkness each night in her bedroom, and creates wonderful creatures to play with and make drawings of…until one day a mysterious girl appears who knows all about her nighttime secrets. Space Battle Lunchtime Volume 2: A Recipe for Disaster, by Natalie Reiss, ushers in the season finale of Space Battle Lunchtime, but finalist Peony (the only Earth contestant) is nowhere to be found—she’s been kidnapped and taken to the set of her show’s biggest rival, Cannibal Coliseum, where chefs compete to cook…each other! Where’s Halmoni? by Julie Kim, joins a young Korean girl and boy on a search for their missing grandmother—a search that leads them into a fantastical world inspired by Korean folklore, complete with mischievous goblins, a greedy tiger, a clever rabbit, and a wily fox. Witch Boy, by Molly Knox Ostertag, finds thirteen-year-old Aster up against the rules of his magical family, where all girls are raised to be witches and boys grow up to be shapeshifters—for instead of conforming, Aster doesn’t shift, and continues to pursue his fascination with witchery…no matter how forbidden that might be. The award judges are Alenka Figa, Ardo Omer and Shayauna Glover. This entry was posted in Awards and tagged Dwayne McDuffie Award for Kids' Comics by Mike Glyer. Bookmark the permalink. I know that Nightlights is a fabulous little book with just beautiful vibrant artwork. A great picture book to share with kids. And Where’s Halmoni? is also a great little story that introduces a few Korean words. Also a favorite from last year. Looks like I am going to have to track down the rest of the books on this list. Thanks for introducing me to this award! I’m so glad to hear that there are awards named after Dwayne McDuffie. He was immensely talented.